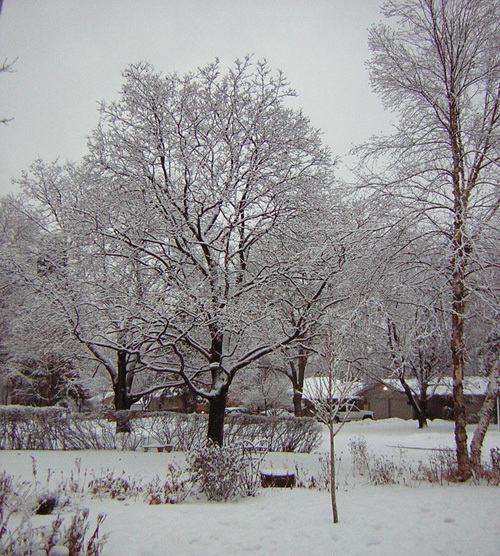 I woke up this morning and stepped outside with Beulah only to find the most marvelous snow falling – big, sticky snowflakes that clung to everything like buttercream frosting. I thought I would share with you some pictures from our lovely morning. 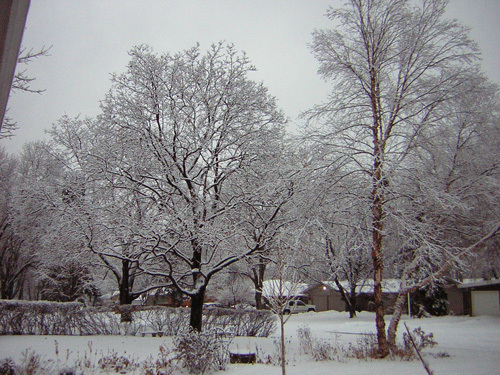 Scene from our front door. 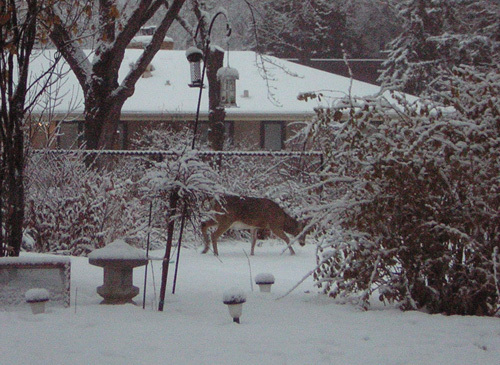 An eight point buck in the back yard! 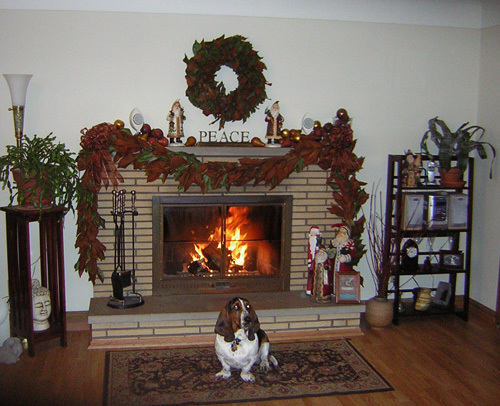 Beulah Mae with her gorgeous self posing in front of the fire. 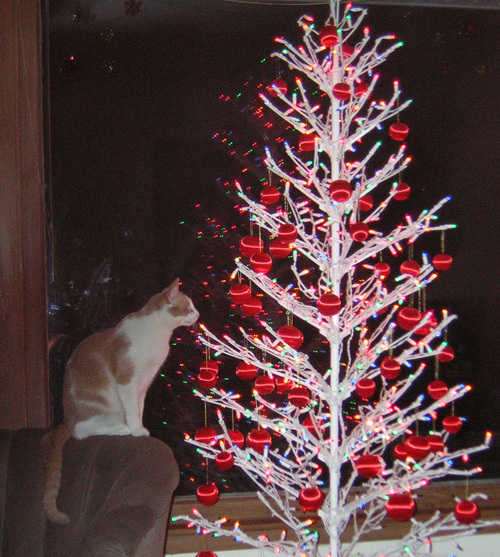 Cletus us obsessed with both the Christmas trees – this is the simple one with only lights and non-breakable ornaments we have upstairs. If it makes it through the season, it will be a miracle, what with Beulah and Cletus both chewing on it every chance they get. A bit of parting beauty. Several of you have wondered, and rightly so, just exactly where I’ve been and what I’ve been up to. I’d love to tell you that I was visiting some exotic locale, or involved in some enthralling project that had so captured my imagination and energy that I was creatively consumed. Alas, that is not the case. Us Leos don’t get “down” very often, so when we do it can sometimes take us a while to recover. (Thank goodness our naturally sunny disposition brings with it strong powers of recuperation.) In my case, November was just a icky, distracting, stressful month – Thanksgiving being the one true exception. I wasn’t blogging because I was using all my energy to maintain some semblance of balance and not keel over due to my lack of equilibrium. A rare confluence of stressors combined to create the “perfect storm” of psychological distress and it has taken me awhile to get everything sorted and back to where it belongs. I dare say I’ve turned a corner now though, so that is the very good news. Christmas is such a cheerful time of year, despite its demands. And my birthmother arrives tomorrow for a three day visit, which has brightened my mood considerably and giving me something to look forward to with joy. So stay tuned, as the days pass I hope to be back to blogging more regularly, and for those of you who have expressed your concern, I thank you from the bottom of my truly grateful heart.